What Minerals Are in Epsom Salt? Kathryn Meininger began writing and publishing poetry in 1967. She was co-founder and editor of the professional magazine "Footsteps" and began writing articles online in 2010. She earned a Doctor of Podiatric Medicine from Temple University School of Podiatric Medicine and a Bachelor of Arts in biology from William Paterson University. Epsom salt is the common name for the compound magnesium sulfate, or magnesium sulfate heptahydrate. According to SaltWorks, Epsom salts were first discovered and named after the town of Epsom, England in the early 1800s. It is thought that Epsom salt was termed a salt because its crystalline structure resembles that of table salt, but it is actually a pure mineral compound. Epsom salts are used in the home as a bath soak, in medicine as a laxative and nutritional supplement, and in gardening as a plant food. Epsom salts should only be taken internally under advisement by a physician. Magnesium is the eighth most abundant element found in the crust of the earth, according to the University of California. Magnesium does not occur in nature by itself; it is always combined with other elements to form a compound. Epsom salt consists of the mineral magnesium in combination with a sulfate compound and water. Magnesium is an essential mineral used by the body for a variety of functions. According to the University of Maryland Medical Center website, the body requires magnesium for muscle contraction and relaxation, proper nerve functioning, activation of certain enzymes and production of protein. It also helps maintain the levels of other nutrients in the body such as calcium and vitamin D. A lack of magnesium can produce symptoms such as twitching muscles, sleepiness and excitability. Sulfates are mineral salts. Magnesium binds to the sulfate compound in order to form Epsom salts. Epsom salt, also called epsomite, occurs as a translucent white, colorless or gray compound, depending on the type and amount of impurity present, according to Mindat.org. Epsom salts are generally found in crusts that form in the dry areas of outcrops of rocks or inside caves. Epsom salts can also be found on the walls of copper and coal mines, and as deposits in dried-up salt lakes or springs. 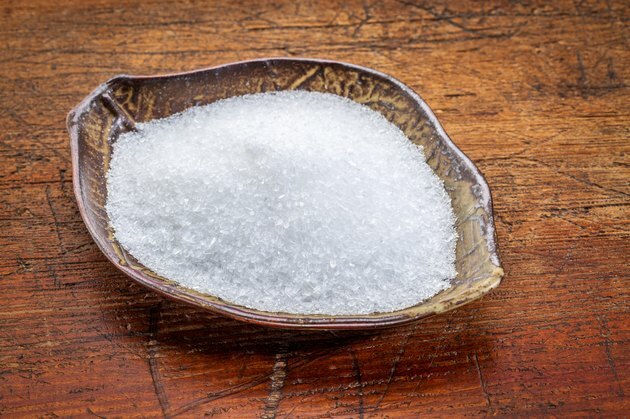 The Epsom Salt Council states that sulfates are needed by the body for formation of certain tissues and proteins, and to stimulate the pancreas to produce digestive enzymes. The main composition of all products containing Epsom salts is essentially the same. All Epsom salt products contain magnesium sulfate in the formula of MgSO4*7H20. The Epsom Salt Council states that both the magnesium and sulfate components of Epsom salt can be absorbed through the skin. Epsom salt can be used externally as a compress for achy muscles. It can also be added to a foot bath or the tub for the same benefit. SaltWorks advises adding baby oil or olive oil as moisturizers to enhance an Epsom salt bath. Why Do Gymnasts Use Chalk? What Minerals Strengthen Blood Vessels?